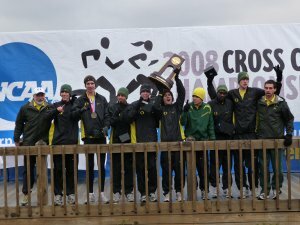 LRC: RUPP And Oregon Are Golden Galen Rupp put away the demons of the near misses and captured his first NCAA title by shadowing Liberty's Sam Chelenga for 9,600m and then outkicking him on the straight to lead Oregon to the team win. Oregon dominated the team title as Oklahoma State had a forgettable day. Super frosh German Fernendez dropped out with an achilles injury (photo of Fernandez in great pain here) while Oregon frosh Luke Puskedra was a very impressive fifth. Gator Track Coach Claims He Could Win NCAAs If He Got Some More Of Urban Meyer's Football Guys To Run It's a shame that apparently 10.01 high schooler Jeff Demps doesn't consider himself a track guy (or at least his coach doesn't). HGH Test Is More Of An IQ Test And Baseball May Not Implement It You'd have to be a fool to get caught by the HGH test ... but then again, baseball players aren't exactly known for their brains. Kipyego Threepeats Susan Kuijken tried to make it interesting, but in the end, Sally Kipyego was too good and she became the first woman to win 3 NCAA XC titles. The Washington women as expected got the women's team title. World Athletics Final Will Be Held Outside Europe For 1st Time In 2010 Morocco is the winner. Paula Radcliffe Thinks UK Athletics Is Headed In Right Direction & Better Results May Happen By 2012 Radcliffe, who also talks about what she'll do when she retires, seems to be a fan of the new head Charles van Commenee as well as the old guy Dave Collins. *Spikes Mag: Another Race To Do Before You Die: Great Ethiopian Run The race conceived by Geb and Brendan Foster is amazing. NYRR head Mary Wittenberg ran it and called it "the best race experience I have ever had." Notes From IAAF Council Meeting A lot was discussed, including making XC part of the Olympics and making the World Champs shorter and more TV friendly. The Council also warned Russian high jumper Ivan Ukhov to not compete anymore while drunk. Drugs: IAAF Meeting Agenda Includes Talk Of Confronting Russians On Their Decision To Backdate Cheats' Suspensions First they were systematically cheating the system, now the Russians are backdating the 24-month suspensions about 15 months. We encourage everyone to write to the IAAF and spur them to take on the Russians. To send suggestions to the IAAF, click here. Chinese Government Mandates Every Child In China Must Run At Least 1km Per Day Until April Seems like a good plan to us. Meanwhile, in America ... kids don't play enough. Another Race To Do Before You Die: Great Ethiopian Run Yesterday we highlighted Japan's Ageo City Half; today it's a race conceived by Geb and Brendan Foster. Boaz Lalang Turns Pro Lalang said last year that he loved Rend Lake but there is just no way a Kenyan 800m Olympian could afford not to go pro. Fukuoka Fields Announced For December 7 ... Just Your Average Field With 10 Sub-2:10 Guys!